HANDS ON BOATS will continue in 2018. Stay tuned for future dates! Give the gift of a Hands on Boats session! Full and Half Day Session Gift Certificates are available until Dec. 20. Don't wait! ​The trim and rails on a boat are more than aesthetic finishing touches, they serve a practical and structure purpose. The final HANDS ON BOATS session participants will work alongside Nate Piper, master boat builder to mill out, fit and fasten these final elements of the new Piscataqua River Wherry. Once completed, finish work will focus on the appropriate preparation and application of finishes. The new Piscataqua River Wherry will be raffled off upon completion. Participants receive raffle tickets as part of their registration fee. Raffle tickets are also available to the general public for $15 each. Buy a raffle ticket. *Prices are per day. Discounts available when you sign up for multiple days or sessions in advance. See additional pricing information below and please contact us for discount codes prior to signing up. Photo by "Raya on Assignment"
Nate is the owner of Piper Boatworks in Rye, NH and director of The Boatshop at Strawbery Banke. Over the past 20 years, he has been involved with wooden boats of all shapes, sizes and ages. 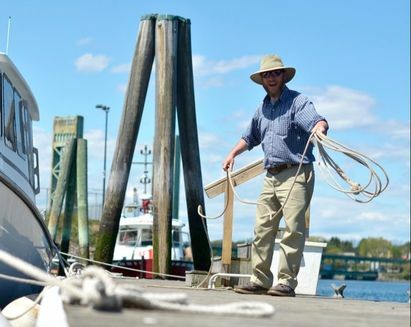 In addition to his current involvement with The Boatshop at Strawbery Banke, he restores and builds new boats in his own shop, including MerryMac sailboats, Nate previously served as the project manager for the construction of the new gundalow Piscataqua. Nate has also worked on the rebuilding of the Boston Tea Party ships in Gloucester, Massachusetts; worked with Harold Burnham on the construction of the Schooner Yacht Isabella in Essex, Massachusetts; and worked on the construction of Kalmar Nyckel, Delaware's Tall Ship. Nate once sailed aboard the HMS Bounty as Crew and ship's carpenter and both sailed as crew and worked on a major refit of Martha Lewis, a Chesapeake Bay skipjack. Nate is a graduate of the Landing School of Boat Building and Design in Kennebunkport, Maine. If you are a museum member and/or would like to sign up for more than one session at the discounted prices listed below, please contact us by email or by calling 603-686-4338 for discount codes prior to trying to register. Preregistration is required and space is limited! The new Piscataqua River Wherry will be raffled off upon completion. All full day session participants will receive two complimentary raffle tickets for each paid session. Half day participants will receive one complimentary raffle tickets per paid session. Raffle tickets are also available to the general public for $15 each. Buy a raffle ticket.